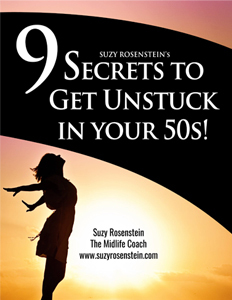 Three reasons why acting your shoe size instead of your age is a great idea in midlife. How what you think about age can affect your feelings. How curiosity can help you in your life. What being more present in your life can do for you. Why laughter can help you be happier and healthier. Why it’s important to understand that your thoughts about age are optional. This week we’re exploring why you should act your shoe size instead of your age in midlife. Specifically, this episode is about the compelling reasons why you should consider acting more like you did when you were much younger, like your shoe size equivalent in age. My shoe size is seven, for example. We take a look at how acting seven is dramatically different than acting 50 and what that can mean in your life. Using the Thought Model, we see that your actual age is “neutral” and doesn’t have an emotional charge until you think something about it. Having this perspective is super helpful because you can see that you have more power and control than you think about what you think and feel. Acting your shoe size typically means identifying more with child-like version of yourself. This isn’t the same thing as being immature. We use this perspective to see how curiosity, laughter and being present can be used intentionally in your life to bring more happiness and fulfillment. 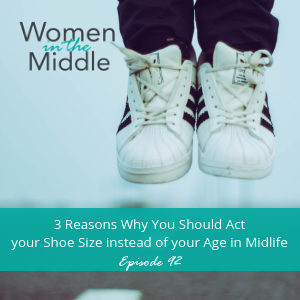 As a woman in the middle, acting your shoe size rather than your age is a good thing!